Fareham Reach is located in the heart of the M27 corridor with Southampton 13 miles to the west, Portsmouth 5 miles to the east and London 76 miles to the north east. The M27 is the principal motorway servicing the south coast and provides good access to the national road network via its link with the M3 at Southampton and the A27 at Portsmouth. There are direct trains to London from Fareham Central Train Station. Both Southampton and Portsmouth are major commercial centres. Southampton has the principal freight port along the south coast whilst Portsmouth, as home to the Royal Navy, has a particular emphasis on the defence sector as well as distribution companies attracted by the central location on the M27/A27 South Coast Corridor. Southampton International Airport provides a range of domestic and continental flights. 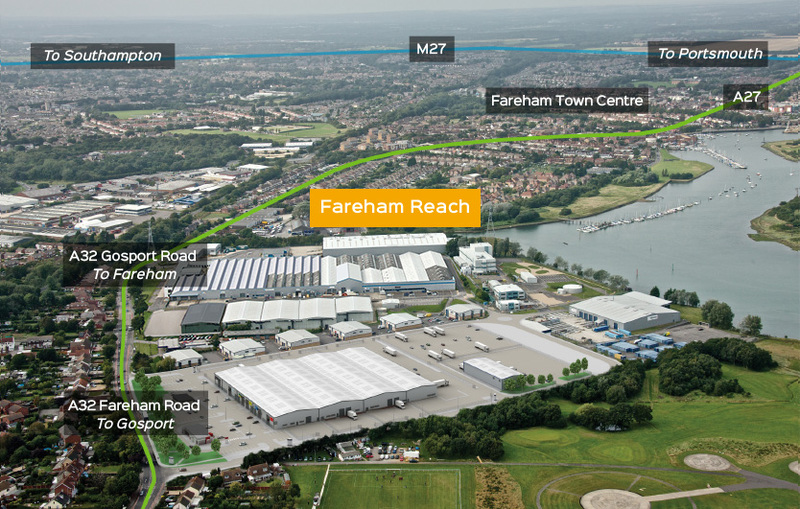 Fareham Reach is situated on the Gosport side of the border with Fareham and is only 1.5 miles from Fareham Town Centre. The property is situated adjacent to the A32, which links Fareham and Gosport and provides direct access to Junction 11 of the M27, which is located 2.5 miles to the north. Fareham Reach forms part of an established industrial area to the east of the A32. Vehicular access to the site is from the A32 via two entrances, one of which is a traffic light controlled junction.